Inside Film Online - How Would Van Gogh Fare In Hollywood Today? HOW WOULD VAN GOGH FARE IN HOLLYWOOD TODAY? What if the 19th Century art world were like modern day Hollywood? 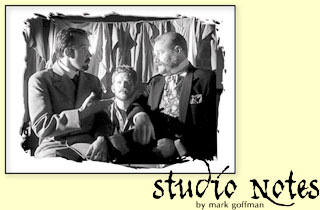 Studio Notes, a short comedy written and directed by Mark Goffman, explores this premise via a young Vincent Van Gogh. "This isn't your father's Van Gogh," explains 2-Pop.com reviewer Guy Cimbalo. "In Studio Notes, Van Gogh's tragedy plays more like an episode of 'Seinfeld' than a lesson in art history." Van Gogh (Greg Pitts) promises his dying lover (Shawn Montgomery) that she will live on through his work. But his every attempt to portray her meets an unfortunate reception from Anton, the gallery owner (Michael Dempsey) and Theo, Vincent's brother/agent (John Livingston). "Use happy colors," urges Theo who has just returned from Paris, where paintings from the new Impressionist movement are selling like hotcakes. "They've got dots!" After driving himself to the point of self-mutilation, the story ends with an ironic twist in the asylum, as Vincent discovers how to portray his lover in a way that pleases both himslef and the world. Studio Notes premiered at Cinevegas, where it won best director finalist and best cinematography finalist. Since then it has appeared at the Tahoe Film Festival, Atlanta Film Festival, No Dance Film Festival (where it won honorable mention), Rochester Film Festival, Hollywood Shorts and Palisades Film Festival. Studio Notes, an engaging and clever take on the artist's plight in a commercial world, is an auspicious debut for first-time filmmaker Mark Goffman.